Those are (from left to right) Roku, Roku 2, Roku 3, and Apple TV. I’m sure there are more, but I’m going to concentrate on the ones we purchased. We purchased a Roku 3. It’s the latest model, and let me tell you…it is worth every dime! It has an Ethernet port that can hook right up with your high-speed internet, or you can stream over Wi-fi like we do. It even has an HDMI port, so even though we’re not paying for HD technology with our cable provider, we can still enjoy HDTV. Best of all, it comes with a remote and earphones so you don’t disturb others late at night. It can be controlled by your Android or iOS device. And just what can you do with a Roku? 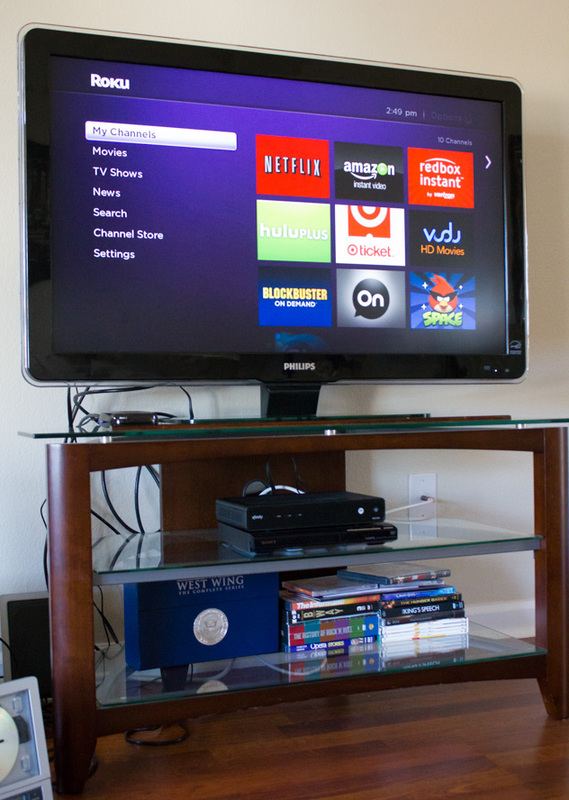 Our Roku 3 offers up to 1080p high-definition streaming. With over 600 channels, the possibilities are endless. You have access to Netflix, Amazon Prime, Redbox, Hulu Plus, Vudu, Blockbuster On Demand, and many more. We actually get MORE with this than we did with cable. Netflix and Amazon Prime are monthly subscriptions and can vary. Those are the two we are trying for a few weeks to see if we like them. Another option is ChromeCast. It’s a simpler streaming device. If you’re paying for high-speed internet, chances are that your services includes access to old episodes of TV shows online — for free. And by old, I mean last NIGHT’S episode. It’s a no-brainer. With ChromeCast, you can watch those shows on your TV. It really is as simple as plugging it in to your TV’s HDMI port, switching the input, and setting it up with your Wi-fi. We decided to put this in the living room and the Roku 3 in our bedroom. We still have access to “non-local” channels’ TV shows despite having the most basic cable TV package. What do you think? Would you cut back on your cable TV services?